At a bus stop in Sarajevo, an election poster for the moderate \"Stranka za BiH\" party (Party for Bosnia Hercegovina) reads, in rough translation, \"Through investment, to new jobs.\" The slogan is a reference to the country\'s troubled economy, and its unemployment rate of nearly fifty percent. 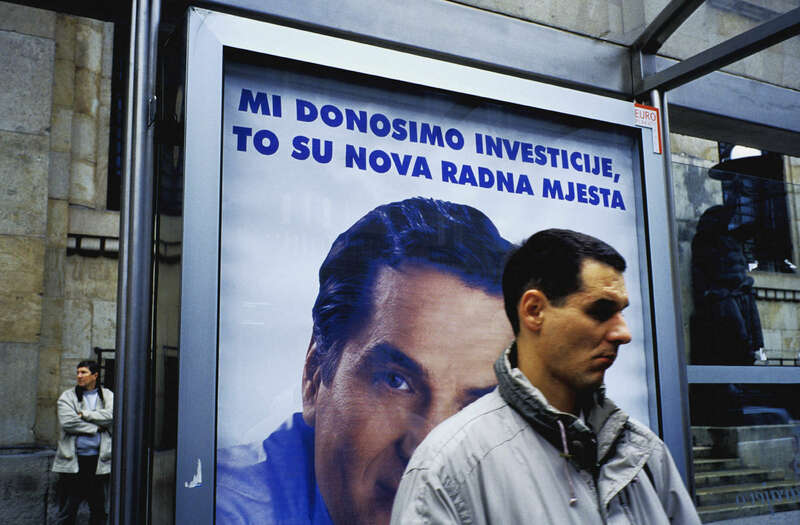 The man in the poster is Haris Silajdzic, who served as prime minister during the war. In this election, all the moderate parties were defeated, as voters returned nationalist parties to power. September 2002.